Market State: Transitional – The market has been more stable over the last three weeks or so. The S&P 500 has had only one outlier day of +/-1.5% or more and that was last Wednesday (+1.55%). Canterbury Volatility Index (CVI)- CVI 106: Volatility remains at a high level but has declined from its most recent high at CVI 125 on December 26th. The US equity market has been remarkably strong since the emotional decline that ended on December 24th. 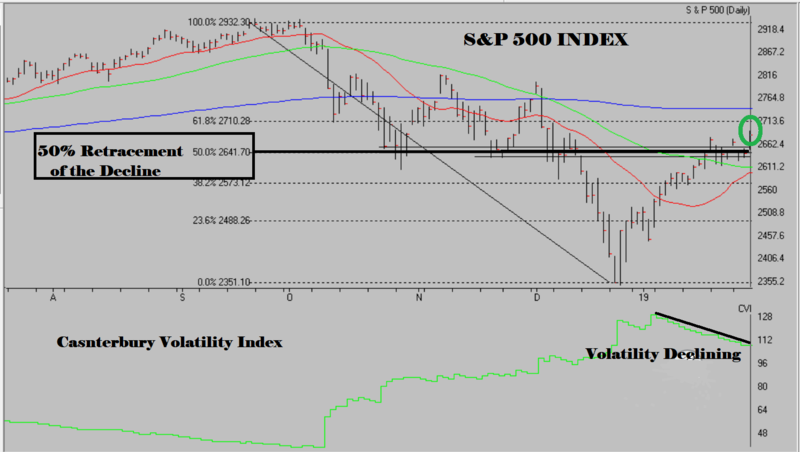 The S&P 500 closed last Friday at 2681. It still has a way to go before it matches its old high of 2931 on 9/20/18. That said, not many would have thought the market would come back as fast as it did. The stocks-only Advance Decline line (number of stocks up vs. down) is higher than it was when the S&P 500 was at its high. A strong A/D line is showing that the rising tide is lifting most ships (strong market breadth). In addition, the market is 88% overbought, which is high, but the market was 98% overbought at this time last week. In other words, the S&P 500 went up 1.6% last week. One would expect that the market would show an even more overbought condition, but in fact the number actually declined by 10 points. This is not a big deal, but it is a positive. Markets do not go straight up with out a correction. As it stands now, the normal kick-back-rally that typically follows a sharp decline, has exceeded expectations. The rally continues to get fuel by those who got scared out of the market and went to cash. Those same managers/investors are now buying, mostly at higher prices, in fear of being left behind. The probabilities of the market putting a “V” bottom and continuing to move to new highs is very unlikely, without first seeing a correction. We will most likely see the volatility come back into the markets as investors get more confident (remember the counterintuitive nature of markets). The Canterbury Portfolio Thermostat has made the necessary adjustments to maintain stability regardless of where the market goes from here.